Guatemala has disputed its land boundary with Belize since its independence in the 19th century. The border and resulting dispute stem from colonial documents, first between the United Kingdom and Spain and later between the United Kingdom, on behalf of British Honduras, now Belize, and independent Guatemala. The de facto boundary, disputed by Guatemala, is based on an 1859 Convention and a 1931 Exchange of Notes and follows the Sarstoon River and then a series of straight lines to the tripoint with Mexico. The north–south portion of the boundary was reaffirmed by the Organization of American States (OAS) in 2000. Guatemala’s claim stems from a pre-independence 1786 Convention, which places a vague historic boundary in the Sibun River which lies to the north of the current border. Guatemala’s claims to Belizean territory have varied over time. 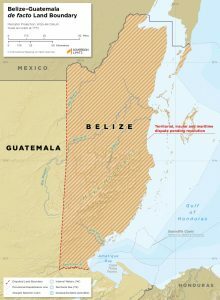 Currently, Guatemala seems to map all of Belize as disputed territory.